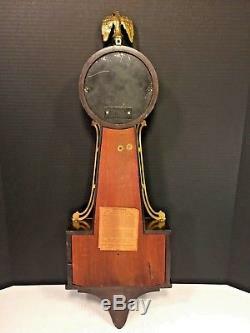 Vintage Seth Thomas Banjo Clock Time & Strike Runs! Would make a great gift for a special occasion, or keep for yourself! Nice looking silver colored tin clock face on this clock. 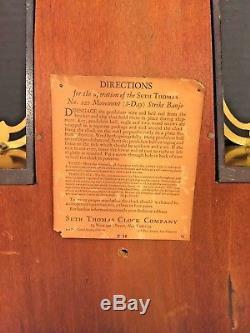 Has the Seth Thomas name on the face and on the paper label on the back of the case. 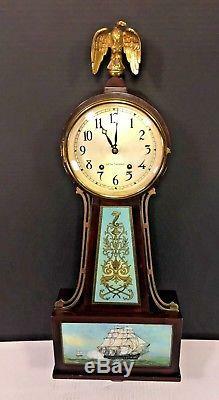 Clock dates to mid 1920s. Most of the paper label is still on the back of the case. The brass lacquered metal bezel is securely attached to the case. The concave glass over the clock face is intact, no cracks or blistering. Case is all there, no cracks or repairs. The glass on the throat and the pendulum door is intact, no cracking or blistering. Also, no loss or crackling of the paint or stenciling. Nice looking gold colored eagle finial on the top of the clock. 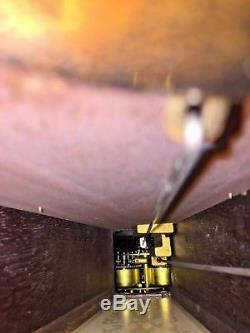 The gold colored brass rails are securely in place on each side of the throat of the case. The clock has been running since we acquired it. 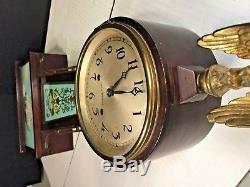 Nice, what appears to be the original brass movement in this clock. 8 Day Movement known as the 120. Strikes once on the half hour and the number of hours on the hour. The clock has a replacement pendulum bob. Have had the clock set up for a week and is in. The clock will come with a newer wind key. 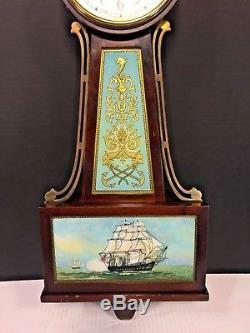 Banjo Clock stands 28.5" tall, by 9.75" across (8" across on at case by clock face), by 4" wide. The clock face is 4.75 across. Let us know if you have any questions or need additional pictures. If you have not had experience with old mechanical clocks before, I would suggest you steer clear. One really needs to have the patience, and skill to work with these great works of art. They are not our modern plug in and go, or change the battery clocks. Make sure that this clock meets your needs and requirements before deciding to acquire it. So, please carefully review all the attached pictures. Ask all the questions you have, come see in person or send a friend to see the item on your behalf, prior to deciding to acquire it. Don't be shy to make an offer, we are always open to reasonable suggestions! Please check out our other Timeless Tokens store listings as we are regularly adding new items. We specialize in antique and vintage. 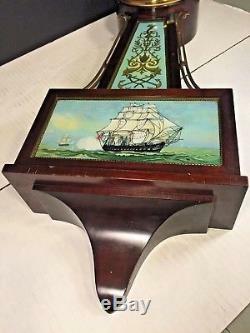 Artwork, books, collectibles, furniture, musical instruments, paper ephemera, marine/nautical, and clocks. Select countries (disclosed in individual item description). All items are as described, with any item history, known defects or imperfections disclosed in each listing. 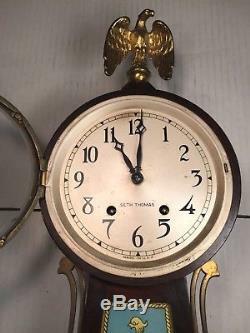 Timeless Tokens , our online store offering antiques, collectibles, and conventional merchandise for every need and occasion. Timeless Tokens represents the fulfillment of a long-held dream to create a business that allows us pursue our passion for finding unique collectibles and everyday items that can be shared with and appreciated by all. Our listings are updated regularly and centered on items that we know best - vintage artwork, clocks, collectibles, toys/model trains, musical instruments, and decorative boxes. We appreciate your taking the time to visit our store, and hope you will provide us feedback that will enable us to make your shopping experience the best it can be. Referrals are an important part of our business. 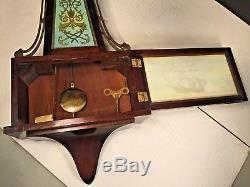 The item "Vintage Seth Thomas Banjo Clock Time & Strike Runs! 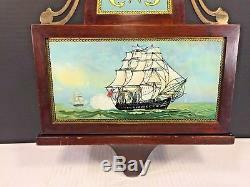 Mahogany Case Ship Battle" is in sale since Thursday, October 25, 2018. This item is in the category "Collectibles\Clocks\Antique (Pre-1930)\Shelf, Mantel". The seller is "hallboys321" and is located in Wilmington, Delaware. This item can be shipped worldwide.